We all know that state and local government finances are a mess. This chart helps explain why. The top line tracks the real compensation of all state and local government workers–wages and benefits, adjusted for inflation. The lower line tracks the real compensation of all private sector workers. The data comes from the Employment Cost Index data published by the BLS. 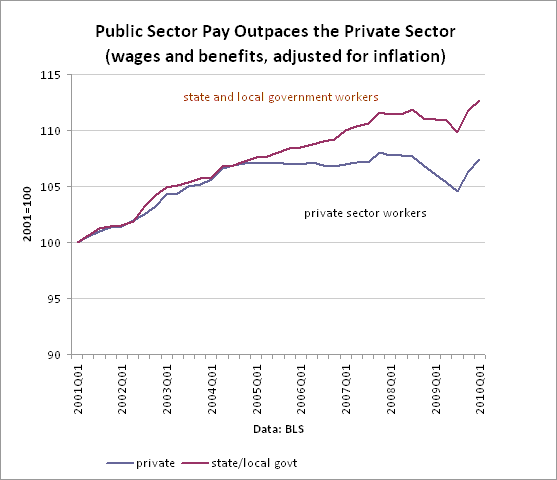 The chart shows that public and private sector pay rose in parallel from 2001 to 2004. Then the lines diverged. Since early 2005, public sector pay has risen by 5% in real terms. Meanwhile, private sector pay has been flat. This one fact explains much of the fiscal stress at the state and local level—why states such as New York, New Jersey, and California are in such a mess. State and local governments pay more than $1 trillion in compensation annually (actually, that’s an astounding number–I had no idea it was that high). If compensation is 5% higher than it should be, that’s $50 billion in excess pay costs for the state. Now, I’m not anti-government, by any means. But this trend is disturbing. In times of crisis and economic struggle, government workers should not be getting bigger pay increases than the private sector. The domestic private sector has really been struggling for a decade, both in terms of job and pay. But the public sector kept paying higher compensation. The arithmetic is very clear. State and local governments can’t keep funding higher wages and better benefits for their workers, while the private sector struggles. As a wise man once said, you can’t wring blood from a stone. And you can’t ask troubled taxpayers to pony up bigger pay gains for government workers than they are getting themselves.